At this very moment, on any given 24-hour news station, a banner will likely flash across the bottom of the screen, cardiac revving music blaring in the back ground: BREAKING NEWS! Why else, after all, would a viewer, clicker in hand rest their gaze on a news anchor when so many other stations offer sublime clickbait. What began as a noble endeavour by Ted Turner, founder of CNN, to launch a station dedicated to news in which viewers could get the most current breaking stories combined with insightful reflective pieces on the times, has devolved into a crass competition for ratings. The slide in favour of commercialism became an avalanche with the advent of Fox News. Their ‘fair and balanced’ coverage was about as even-handed as the villainous one-armed man from the movie, The Fugitive. But people who felt unrepresented by the urban liberal elite, watched the licentious theater with unflinching loyalty, and so other stations followed suit with similar histrionics. In the name of debate, talking heads were made to yell at each other on camera and if insults were hurled, so much the better. It took a comedian, namely, Jon Stewart to put an end to CNN’s such ‘debate’ show called Crossfire. Appearing on the show in October, 2004, instead of going along with the show’s two hosts, Paul Begala and Tucker Carlson, Stewart accused the show of partisan hackery and said the hosts were “hurting America,” asking them to stop. Throngs of viewers agreed and within months, Crossfire was cancelled. It seemed a triumph of media democratization but the appeal to masses has led to pandering to lower instincts. The appeal to the lowest common denominator is shaping the content of TV and popular culture more than ever. Shaped by two dominating principles – sensationalism and simplification, which the American sociologist Robert McChesney, in his book Rich Media, Poor Democracy, defines as the consequence of “hyper commercialisation,” it has led to ever fiercer ratings and circulation wars, which inevitably leads to what is called “dumbing down”. To succeed, the media industry tries to appeal to the lower instincts of people. In the “democratic age” news and information have been transformed. The way politics is covered has changed radically. Papers don’t “report” news, they quite often present it according to their preferences and prejudices. The growth of columnists has led to the birth of a “Commentariat”. It contains a few excellent and analytical minds, but all too often reasonable, balanced voices are drowned out by journalists who seem untainted by facts or deeper knowledge but replace this with gleefully presented prejudices. A lot of modern political journalism ignores context and complexity, presenting everything in black and white, while the nature of politics most of the time is a balancing act between contradictory interests and demands. No surprise, then, that politicians are losing control over the political agenda. And, this has led to the emergence of populist leaders, the world over, including and especially – King of Bluster, Donald J. Trump. Dog-whistle politics fell under the media’s radar so far as reportage and commentary were concerned. The result is that US welfare policy has been framed around the myth of exploitation of the system, leaving multitudes living below the poverty line without access to decent education, proper nutrition and adequate healthcare. 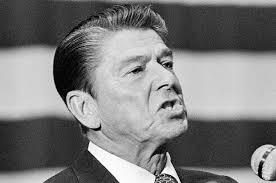 Is it no wonder that crime sky-rocketed after Reagan was elected president? The media’s failure has, therefore, had serious consequences on American society. Sensationalism and oversimplification are affecting the output of all media in all democratic countries where the press is supposedly free. There is less room for a balanced approach, for analysis instead of going for the crass headline or extraordinary story. The merciless hunt for personal skeletons and inconsistencies in political positions of politicians and other public figures has replaced any reasonably competent critical review of policy. Furthermore, the rhythms of politics and the media are drifting apart. After the end of the great ideological divide, politics is more often than not undramatic, complex, not easy to understand and therefore more difficult and boring to report. Quite often results of political decisions, in education or welfare, can be judged only years after implementing them. That is the opposite of what the modern media want. They have a 24-hour mindset, shaped by the demand for ever shorter soundbites. There isn’t the space for nuanced response let alone the patience to evaluate policy for effect, years after implementation. Media language has changed, too. What we are observing is an adjectival degradation. Every report, coming from inside governments or institutions outside is, if it contains some form of criticism, therefore “damning”, “devastating” or “scathing”. Warnings, which most of the time were not heeded anyhow, are “stark”, differences of opinion between politicians of the same party are “dramatic splits”, developments are “alarming” – the consumer of the media is confronted with a permanent linguistic overkill. Official language is evolving in the opposite direction, it is becoming more sanitised, cautious, bureaucratic and politically correct. All this has contributed to change democratic politics for the worse. The electorate has become hostile and distrustful of the media and politicians alike. Trust has broken down threefold, between people and politicians, media and people, journalists and politicians, with the latter now observing each other with deep distrust and mutual antipathy. A vicious circle has established itself. The trend had been set, however, long before Trump’s explosive entrance to the scene of presidential politics. Here’s a case in point: During the Obama administration, renowned investigative journalism eviscerated the cover-story that was fed to the media regarding the apprehending and killing of Islamic terrorist, Osama bin Laden. The alleged mastermind of the 9/11 attacks, which killed over 3,000 people in the US in 2001, and resulted in the collapse of the World Trade Centre Twin Towers was found in a compound in the heart of Pakistan’s military establishment, a stone’s throw away from the Pakistan Army’s main military training school. But the Pakistani’s claimed no knowledge of the terrorist’s whereabouts and both the US and Pakistani governments claimed the operation to nab America’s most wanted killer was done without the latter’s knowledge. The line was fed the media and resulted in the creation of a fictive history through the Oscar-winning film, Zero Dark Thirty. Hersh reported that his contacts told him that once the US was reasonably certain that bin Laden was in the heart of Pakistan’s military belt, they told the generals that they must give up bin Laden or face the kind of firestorm unleashed on Afghanistan. In addition to this stick, the carrot of payments was used to induce the generals to turn on their prized guest. Bribes paid, US helicopters landed on a patch of land protected by scores of anti-aircraft guns without a shot fired. A Pakistani intelligence officer led the now famed Seal Team 6 through the compound to where bin laden was resting in the compound and promptly left so as not to witness the gunning down of the terrorist and his youngest wife. 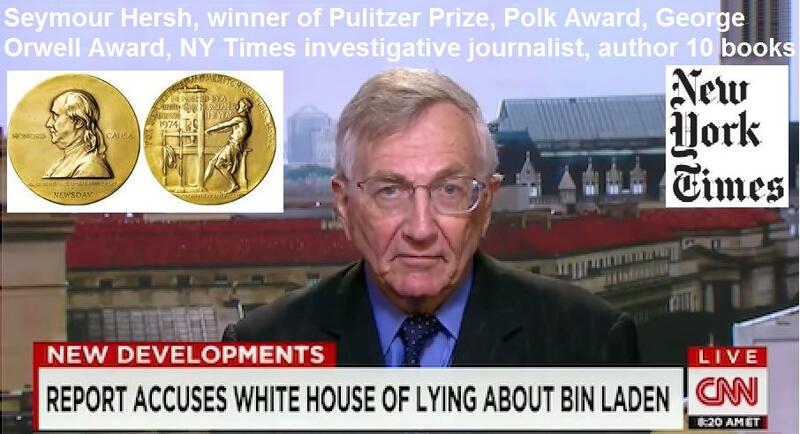 Rather than celebrate Hersh’s scoop, the mainstream media cast doubt on his account. Indeed, he had to publish it in a non-US publication, The London Review of Books. The article immediately drew stinging criticism by US government officials, and Politico called it “an alternate history.” Indeed, having a long history of writing for the New Yorker, he’d offered it to the reputed magazine, first. They passed on it just as they’d passed on a 2013 article by Hersh alleging that the Obama Administration “cherry-picked” intelligence on the chemical attack in Syria to make the case for attacking President Bashar Assad. Not a single large media house, during the controversy, sought to verify or definitively disprove Hersh’s story by tapping their own sources in the region. Instead, they attacked Hersh – and by extension The London Review of Books, itself no slouch in journalistic creds. For if Hersh’s story was thinly substantiated and unfit for American media, then it follows that The London Review of Books is a slipshod outfit, willing to publish rumours as fact. The editors of TGC find this rather hard to accept. This case is just one of many, all of which demonstrate that self-criticism is not popular among those in the media. Indeed, sometimes it seems that’s the media’s only taboo. With media watchdogs having no teeth, it falls to the media to self-evaluate. Absence of such introspection fails the people whom the media claim to serve. Democracy and civil society are premised on the notion that the citizenry are informed, else they cannot effectively function in the public interest. Without media organisations aware of their own power and responsibility, an informed citizenship cannot be sustained, and democracy itself fails. We are seeing this in 2018 with a largely clueless administration in power, making outlandish statements and blowing up international treaties in the name of a slogan, “America First.” It has fallen to shows like “Last Week with John Oliver” to point out the harm that such policies are having on average Americans, the rest of the media focused on the drama and hype rather than the impact on the ground. If this trend cannot be reversed the political poorer, more devoid of substance than it is now. 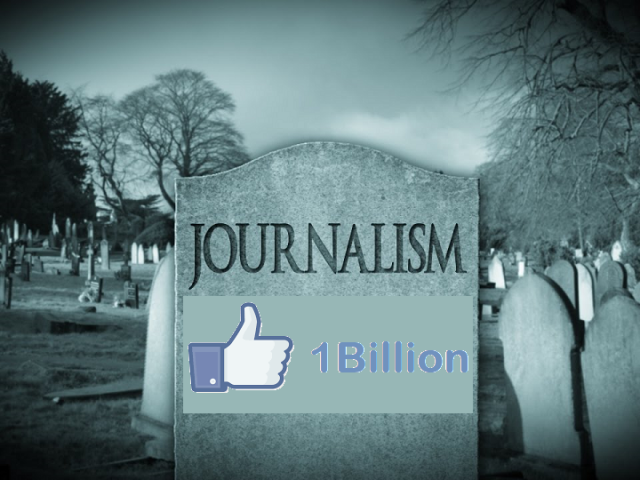 The media has acquired an arrogance on par with Ancient Rome. Most have not realized that their once prestigious entities have become ghosts. For the others, the barbarians are at the gate.